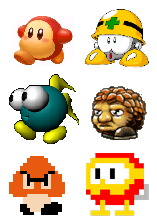 Waddle Dee, a Met/Metool/ Mettall/Mettaur/Hard Hat, a Monstar, a Pooka, a Goomba, and a Bogey. There are a large number of video game enemies and creatures which physically resemble giant heads with eyes and feet. These bizarre creatures are commonly the The Goomba in their respective games and may become associated with their franchise if they appear in multiple installments. Where or what these strange creatures' internal organs are is a mystery. The most they have with regards to other limbs are stretchy, stubby stumps or flippers in place of arms or hands. Otherwise, expect them to lift and manipulate objects, if they must, with Invisible Anatomy. Occasionally they lack any arms or legs at all having to bounce or roll to get from place to place. The reason for this is partly because it's cute but mostly because of practicality; back in the 8-bit era, most video game sprites had to fit in 16 x 16 squares. The easiest way to design a recognizable yet harmless-looking character with that many pixels is to just draw a big-eyed face, and put feet on the bottom to justify its ability to walk. Although most commonly associated with enemy creatures Player Character examples are certainly not unheard of; again, due to system constraints an easy way to design a recognizable character in low resolution is to make their head as big as possible with this trope being the logical conclusion. A subtrope of Cephalothorax, Cartoon Creature, and Our Monsters Are Weird. See also Super-Deformed. The exact opposite is Tiny-Headed Behemoth. Bubbles in The Legend of Zelda are skull versions of this. They either hop around or use tiny wings to fly. The Twisted Tales of Spike McFang has enemies that are waddling heads of garlic. The Dread Heads from Crüe Ball are skulls with sandaled feet that wander the playfields. Super Mario Bros.' Goombas are the Trope Codifier for Waddling Head enemies. They're supposed to be stout mushrooms. Or maybe chestnuts. Try not to think too hard about it. The Galoomba variety intoduced in Super Mario World are a better example, being more explicitly chestnut-like and lacking anything but feet below the head. Bob-ombs are another example, walking Cartoon Bombs with eyes, feet, and (later) a windup key. These guys went through some freaky design phases. Mega Man's Metools are just helmets with feet. They are also much tougher than most examples on this page being protected by their helmets until they are just about to attack. The main character of Eversion. Also the regular enemies, although they end up being footless Slithering Heads by the end of the game. Gooms, Bandineros, and certain other enemies from the Wario Land series are this kind of enemy. Most minions in Billy Hatcher and the Giant Egg. The Undergrounders from Mr. Driller. The Pookas from Dig Dug. The Great Circus Mystery starring Mickey and Minnie features different versions of the waddling head in each level. Ninja-kun: Majou no Bouken has daruma dolls that lack legs but shuffle around all the same. In Wario Land: Super Mario Land 3 and Wario Land II, there are Gooms, which are a Goomba subspecies found in the Wario series. Wario Land 3 has Spearheads and Para-Gooms. Wario Land 4 has the slightly more bird like Marumen, who are found in the Hall of Hieroglyphs and Palm Tree Paradise. Finally, Wario Land: Shake It! has Bandineros, which also act as the Shake King's main minions. Number Munchers and the hostile Troggles. The various enemy characters in Fruity Frank. Rabites, icons of the World of Mana series, are essentially furry blobs with puffy tails and rabbit ears. Though they are generally regarded as pitifully weak, there are some terrifyingly formidable variants. EarthBound's Mr. Saturns, and the generic enemy Foppy and its orange Palette Swap counterpart, Fobby. Yukkuris in Touhou fanon are essentially these, though "bodied" versions do exist. Prehensile Hair may or may not be included. The true form of the final boss from the arcade game NARC, Mr. Big, was a giant head. The Minirobots from Mini Robot Wars, who bear a huge resemblance to the above-mentioned Metools from Mega Man. They're not so much waddling heads as they are standing heads, however, because they are not shown walking in-game. In Chulip, Michio Suzuki. Also, your dad, though you don't find that out until almost the end. Dizzy of the Dizzy series is an egg with boxing gloves, as are the other Yolk Folk. The monsters from the arcade spin-off Fast Food go even further: they have no arms. Both the titular characters of Head Over Heels. The titular Koongya characters ◊ that appears in the Korean online games Koongya Adventure (Now defunct) and Green Village, as well as a animated series based on the games. They are small lifeforms who are like a cross between Anthropomorphic Food (although there are Koongyas that are not based on food such as dung Koongya.) and Kirby. Pac-Man and Ms. Pac-Man are probably the Ur Examples. Although the official artwork has always shown them with arms and legs, their earliest games took it a step further by showing them as "pizza shaped" heads in-game. 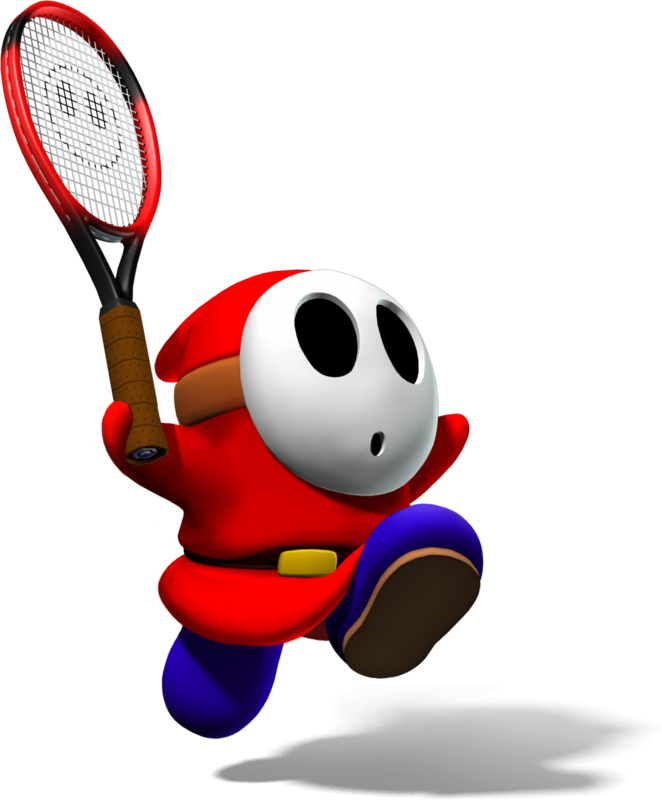 His Super Smash Bros. 4 appearance actually incorporated this into his character. He can switch between his anthropomorphic form and his "pizza" form freely depending on what attacks he uses. Kirby of the Kirby series is a rare Player Character example, but his foes include such quintessential waddling heads as Waddle Dee. Starfy resembles a Waddling Head more than a five-limbed aquatic creature rightfully ought to. Then again, he's not a starfish or a star. He's a creature that resembles the two. The main character and many enemies in Mr. Gimmick! An old computer game called Zeek the Geek features a little red alien who fits this trope. Most characters in Purple are wadddling heads, including the player character. BLOB, the protagonist of Starquake. Miss Chack'n & Mr. Chack'n from Chack'n Pop. They have three-fingered hands, but no arms. Mr. Chack'n does have legs, but shows it only when he jumps. The New Zealand Story has a neckless, legless, tiny-winged player character that is supposed to be a kiwi bird. From Adventures of Lolo we have Lolo and Lala. Nuts, Milk and Yogurt from Nuts & Milk. The Angry Birds and Bad Piggies. The protagonist of Dweep is a purple ball of fur with eyes and tiny feet, who moves by hopping around. Many Pokémon are like this. In the fourth generation games, there's a new section in the Pokédex for body-types. Oddish, Poliwag, Bonsly, Seedot, Azurill, Shroomish, and Tangela are amongst the many. As of Pokémon X and Y this is a common body shape for the newly introduced Fairy type with Jigglypuff, Clefairy, and Marill all becoming part Fairy type. Berserk: While Guts and co. are looking for Casca and Farnese in Qliphoth, one of the many strange creatures they pass resembles a bald, waddling head with a Gag Nose. He has received the Fan Nickname "Schnoz" and become a meme. In Dog Days, because of some protective enchantments, when someone is wounded or "killed", they temporarily turn into one of these rather than dying. Don Patch from Bobobo-bo Bo-bobo (and his Kopatch lackeys). Most baby and in-training form Digimon. Very few of them have any sort of limbs at all and most are generally constrained to bouncing around. Yubaba has 3 of them in Spirited Away. They get turned into a copy of Yubaba's baby by Zeniba later. In Castle Waiting, Affably Evil demon Leeds usually manifests as a demonic humananoid head directly attached to a pair of short goats' legs. In Saga, the two ladies who welcome The Will to Sextiliion have bodies consisting of large heads and long legs. MythBusters: Jamie Hyneman once made an (adorable) army of Waddling Head robots in order to see if a platoon marching in lock-step across a bridge could collapse it. "The Head Detective" sketches on In Living Color! featured your typical Cowboy Cop who happened to be one of these. He'd bring down the baddies by getting his partner to toss him at them. A commonAmusing Injury on Super Dave involved the tituar inept stuntman being smooshed into his helmet, leaving only his head and feet. This was also the series mascot, and was breifly available as a plush toy. Mr. Potato Head might be one of the oldest examples of this trope. He is a Waddling Potato-Head. Furbies are waddling hamster-owl heads. The webcomic Kid Radd has Bogeys as the Goombas of the fictional Kid Radd game. In The Inexplicable Adventures of Bob!, Molly's pet tentacle bunny Snookums is basically this, although he hops instead of waddling. Dan and Mab's Furry Adventures has Fluffy . Deconstructed in Buck Godot: Zap Gun for Hire; the Beemahs are a race of digitigrade Waddling Heads, and as a result require assistance with vital life functions, which is used to force them into slavery. The characters in the Tales of the Blode flash animations. Vocaloid: Tako Luka, which can be described as a Super-Deformed version of Luka's head with octopus tentacles. JubJubs in Neopets (cute fluffballs with humanlike feet) and Kikos (inexplicably bandaged spheroids with clawed hands on the ends of two bendy arms). JubJub feet seem dexterous enough to serve in the office of hands. Kikos are aquatic creatures which use their arms to swim or paddle; on land they bounce. Looney Tunes: Marvin the Martian temporarily became this trope whenever his doomsday devices backfired, reducing him to a helmet waddling around on oversized shoes. Many of the characters from VeggieTales, such as Bob the Tomato. Though in his case it's more of a Bouncing Head, since they also have no feet. The title character of Fat Dog Mendoza.